Sarah Caudle is a seascape artist who creates a visual escape to paradise for others to find a sense of peace, happiness, and aloha. Born and raised in Atlanta, Georgia with a background in design and sustainability, she moved to Honolulu, Hawaii where she followed her dreams of being an artist and designer. 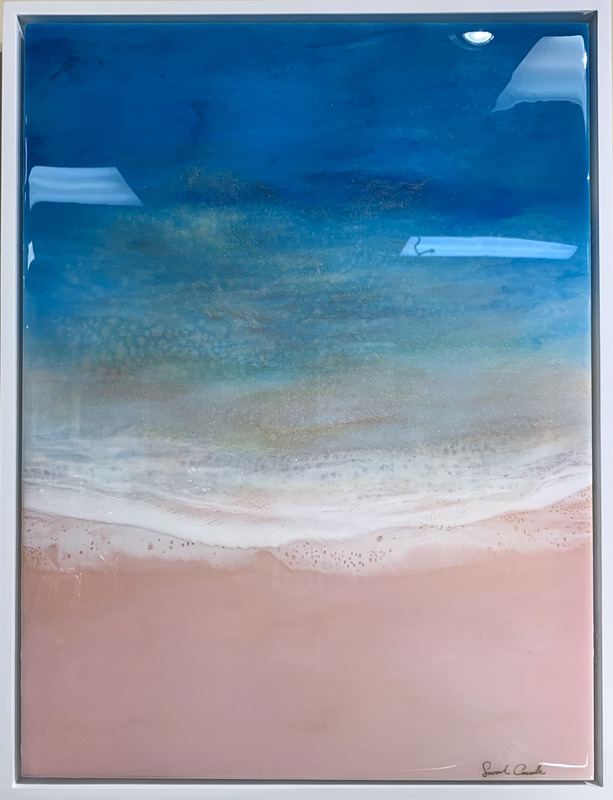 Inspired by the sea, she depicts the beauty of Hawaii's beaches through dynamic colors, fluid movements, and organic compositions. Using acrylics and resin on wood panel, each original painting is completely unique and full of depth. As light reflects off the glassy surface of the resin, the complexities of the multi-layers are revealed, conveying a sense of wonder. She builds up each piece one layer at a time, carefully controlling the flow of the resin, while allowing it to settle on its own, emulating the movement of the ocean. When she is not painting, you will find her swimming or surfing in the beautiful ocean, practicing yoga under the warm sun, or hiking with her puppy Mowgli and boyfriend Daniel. She is in constant awe of the unique beauty of Hawaii, which is expressed through her art.